IB PYP – "Integration XXI"
Being a primary step in the personal development, primary school sets the goal of preparing and educating curious, smart, environment-friendly students, aiming to create a safe world, preferring our own culture and history, respecting other cultures. Our school offers PYP program for students 3-12 years old from the preparatory till 4th grade. We are educating, bringing the education to «real life» as close as possible. Inter-subject education possibilities help us to involve every student. PYP program is focused on the personal development, working on the following: researching, thinking, communicating, taking care, haromonious, reflecting. It is called «IB Learner profile». To achieve the goals set intersubject system is set in place, covering all the subjects in the primary school. ◦ Who we are - learning yourself, your beliefs, values, personal, physical, psychological health. ◦ Where we are in place and time - ability to browse through time and space, family history, link between the person and the society from the global point of view. ◦ How we express ourselves - the way we are learning the world and expressing our ideas and feelings. ◦ How the world works - learning the nature world and its laws, link between the human and nature worlds. ◦ How we organize ourselves - learning system interaction, created by the human, social activity. ◦ Sharing the planet - learning the rules and being responsible for sharing limited natural resources with other people and animals, solving the problems and protecting the peace. 1 thinking - being able to use the previously gained experience, to express your own thought, consider different options to find the right one. 2 social - being responsible, listen to others, have your own point of view, based on fairness and equality, being a team player and discuss. 4 self-organization - time-management skills, physical development, action plan creation, safety precautions, healthy way of life, rules of behaviour. 5 researching - being able to ask questions, observe, collect and analyse information, present the results. Language is the linking chain of the whole educational process, that’s why PYP focus is on using the language in different subjects, not just learning it. Every education year presumes expected results in speaking, listening, visual understanding, reading and writing. 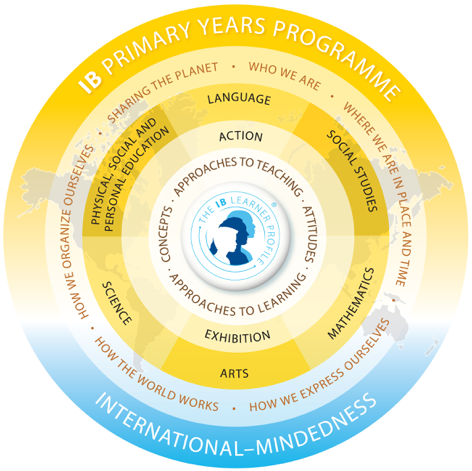 In PYP this subject means a moving tool of investigation activity, giving the source of understanding and evaluating the world in the global context. Main focus is on learning to work with the data, make caluclations, understanding space and forms, functions and numbers. Biologiy, chemistry, physics - these aspects help us to understand the world phenomenon. Students are learning behaviour samples and people and animals profiles, nature, geography, gravitiy and Sun System laws, material world, forces, energy, magnetism. This subject goal is to develop intercultural understanding and respect of every human, to his culture and belief. It is achieved by learning organisation systems and economics, ways of interaction, groups and societies, ways of adaptation to the changes in the word, technical progress influence on people and the environment. Its goal is to provide the right skills, focusing on physical, intellectual, emotional and social development, provides enough knowledge to choose the healthy way of life. Subjects - choreography, theatre, music, painting - all of the involve the student in the creative process. They learn to express their opinions about pieces of art, motivating them to create their own. In respect with the school language policy, these subjects are taught in Russian. Besides that students have the possibility to learn the second language. In our school the second language is English, starting from the preparatory class. Student, having native language, different to Russian, has also the right to study in our school. Every student has his own portfolio. It is a collection of all his works in different subjects, that helps to evaluate his progress. Student choses portfolio sources himself. It can be works that he is extremely proud of. PYP program finishes in the fourth grade by PYP exhibition, that demonstrates students’ progress and is conducted in the way that students choose themselves, supported by all the school community. PYP is the first stage in the IB and student development continues in the secondary and high schools. Maximum development is possible in terms of inheritance of all the three programs (PYP-MYP-DP). PYP program helps students to study in the right investigation atmosphere in terms of school subjects, helping them to express themselves. Students’ ideas are listened to, their passion for knowledge is nurtured. PYP education program is focused on personal development, in which student becomes investigator, aimed for knowledge, thinker, communicator, open-minded, brave, caring, harmonious and reflexing. It is called «IB Learner Profile». Intersubject system is developed in PYP to achieve these goals.